This is a set of 9 manuals compiled through the years by Dr. Mittleider targeting specific garden topics in a precise manner. The manuals range in size from 7 to 25 pages in length. Describes visual deficiency symptoms of most plant nutrients for many vegetables. This contains a well organized and easy to understand way by which you can discover what’s really wrong with your “sick” plants. Extremely valuable, a 25 page wealth of information summarizing important facts about all 13 essential nutrients that man can supply. Another must-have for the serious gardener. Teaches about soil testing, the profitable use and placement of lime and other fertilizers, the importance of drainage, crop rotation, and improving crop varieties. You also learn how to test the viability of your seeds, how to inoculate them with beneficial bacteria for increased yields, and several other important topics every gardener should know. Describes how you can fool Mother Nature, by the use of greenhouses, greatly extending your growing season even through the winter months if you have supplemental heat. Several important topics pertaining to greenhouse growing are covered, along with instructions on avoiding the problems that can occur. Valuable instruction for survival situations when you cannot obtain any fertilizers, or a short-term need in a developing country. Gives you the knowledge you need to use manure wisely and properly, including the benefits and the hazards, and detailed instructions on ways to maximize the benefits your garden can receive from this often under-used resource. The plant world depends entirely on osmosis for food and water, and yet most gardeners are ignorant of how this scientific principle works, and of how the improper use of fertilizers can actually hurt their garden. This 9 page manual will save you from many mistakes. The many types of soils and their essential functions, along with the steps needed to make them productive, are discussed simply and clearly. Soil acidity and alkalinity are also discussed. 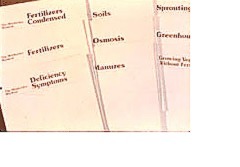 Instructions are given to make your garden highly productive regardless of your soil pH. The importance of proper soil drainage, along with instructions for successful growing in over-wet soil, are given. And the solution to gardening in worn-out soils is also provided. There are many advantages to be gained from growing your own seedlings. You will discover these, as well as learning the nursery growers’ secrets about successfully sprouting your seeds, and about growing and transplanting seedlings and keeping them healthy and strong.